Calcutta High Court recruitment from 28-09-2018 to 29-10-2018. A written exam will be conducted on 25-11-2018 for the selection of suitable candidates for this Group D Posts. 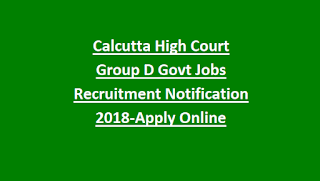 Admit Card for these Group D posts of Calcutta High Court recruitment exam will be available from 10-11-2018. 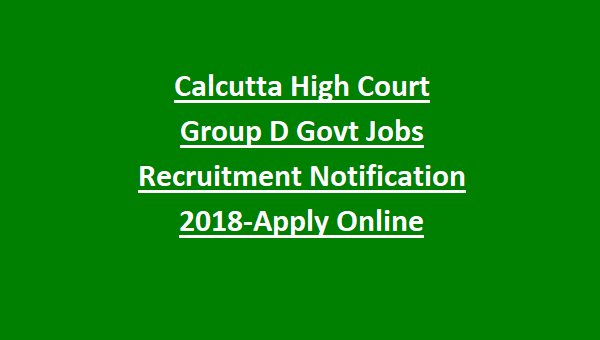 Written Exam Pattern and syllabus, qualifications, salary and other details of this Calcutta high Court Group D Posts are mentioned below. There are total 221 Posts in this Group D recruitment of Calcutta High Court. Available Posts are Farash/Peons/Orderly, Barkandaz, Darwan, Night Guards and Cleaner. As on 01-01-2018 age limits for this Group D jobs is 18-40 years. Age relaxations are applicable as per WB Govt norms. 8th class passed candidates are eligible to apply for this Group D posts. An objective type written exam will be conducted for this Group D Posts of Calcutta High Court recruitment. Candidates who are interested in these Group D posts they can apply online through the official website of www.calcuttahighcourt.nic.in before the last date of 29-10-2018. Exam pattern and syllabus, exam result, admit card dates and other information available in this website only.